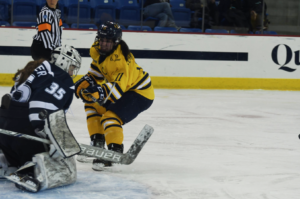 The Quinnipiac women’s ice hockey team lost its second straight game to New Hampshire 2-1 on Saturday at the Frank Perrotti, Jr. Arena. 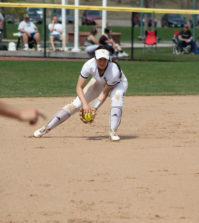 Despite the loss, Quinnipiac head coach Cass Turner was still pleased with the effort given by her team and thought it was good to see what adjustments they need to make. The only Quinnipiac (13-13-2) goal of the game was on power play scored by sophomore defenseman Kate MacKenzie at 8:41 in the first period. That was MacKenzie’s first goal of the season, but the Wildcats would quickly come back to score at 11:44 in the first period on a goal by junior left wing Devan Taylor. 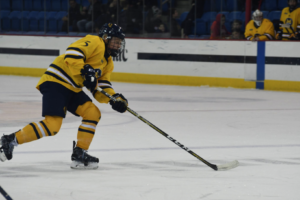 Quinnipiac captain and senior defenseman Alicia Barry talked about how playing New Hampshire (13-10-6) gave the Bobcats a good evaluation of what they need to work on going forward. 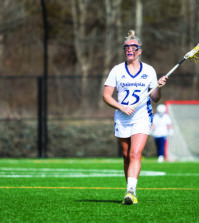 New Hampshire carried the momentum into the second period scoring in 40 seconds by senior center Kate Haslett. That would be the last goal for the rest of the game as each team was able to hold each other off the scoreboard for the rest of the game. The third period was highlighted by play of freshman goaltender Allison Small. Only making her third start in goal, Small was able to limit New Hampshire to just two goals and make 35 saves on 37 shots. Small shutout the Wildcats in the third period and impressed her coach with the adjustments she made. 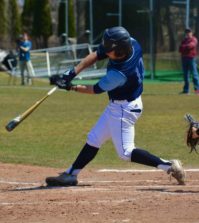 This is the last out of conference game for the Bobcats, but Turner was very impressed by the skill level New Hampshire brought. The Bobcats will play their next game on the road against RPI where they will look to get their fifth win on the road and 10th in ECAC play.